“Sometimes all we need is a little push and encouragement from those that have been in the struggle” -Community Member. Since its inception, Solidarity Uganda has focused on inspiring, training and providing strategic guidance to empower communities with skills and knowledge/ power for strategic nonviolent actions and movement building against injustice and oppression. This has been done across the different regions of Uganda (Central, Northern, Western and Eastern regions of Uganda). While some of the empowered communities have engaged in a number of actions in their communities to fight injustice, corruption and oppression, there are still repressed communities who haven’t taken a stand against the repression meted out on them. This is due to a number of reasons, top of which include apathy (thinking that there’s nothing they can do to change the status quo so better just endure and focus on personal survival) and fear of backlash from the oppressors. Some of these communities haven’t yet interfaced with live situations where nonviolent resistance and civil resistance have been powerful in overthrowing repressive masters and dictatorial regimes. 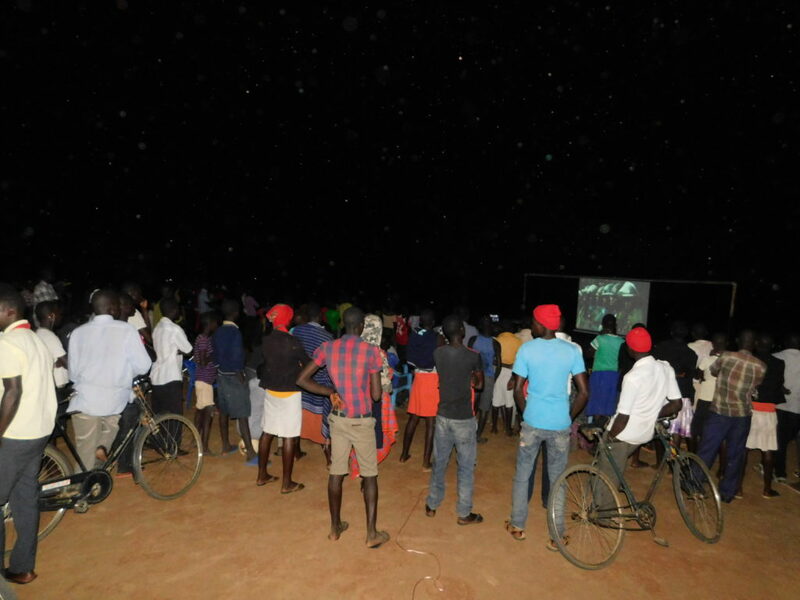 We thus had a film screening caravan to reach out to such communities as these. For three weeks, we travelled across the country in three different regions (Eastern, Northern and central) screening films on civil resistance and non-violence. We had Taking root- Wangari Maathai screened across the three regions. Taking root is a Kenyan documentary acted by rural women led by Wangari Maathai. The women stood up against deforestation that was claiming Kenya’s environment and livelihoods and consequently rising against the dictatorial government of President Moi which was characterized by corruption, unfair arrests and murders amongst others injustices. When people realize that other ordinary citizens have been through the same struggles as they are facing, they are inspired and motivated to keep fighting for their rights. It is important for people to know that they are never alone in any struggle. Taking root inspired these communities more than any other methods we have possibly applied in reaching out to them. Sometimes the oppressed are afraid of standing up to injustice because they think they are not powerful enough to cause influence but Wangari Maathai and the other women refuted that for them. Rural and ordinary as the women appeared, they shook the whole Nation in very non-violent ways. They did not just save the trees, they also saved the entire Nation from the despotic government of President Daniel Arap Moi. These actions challenged to rise and speak against injustice and oppression. Important to note is that most communities in Uganda are facing a lot of repression in form of land grabbing, unfair and brutal evictions, corrupt leadership among others. Such films are therefore a great inspiration to them.